ACB Group’s vision is simple – to deliver impressive design and construction using cutting edge technology and the industry’s best minds. ACB Group – Design and Construct are a solutions-based business focused on adding value to our customers and our business. They are a one stop shop taking full responsibility for the solution delivery of your external envelop and internal cladding solutions. By providing the complete design and build solution for your building envelope, including structural steel, cladding, roofing and façade systems along with internal cladding solutions they give their clients piece of mind. They are the first Specialist Contractor in their sector to deliver BIM (Digital) solutions direct to our clients with focus on delivering the benefits of BIM process and 3D digital design and collaboration to design and build projects. They offer coordinated digital construction with true collaboration enabling a single version of the truth. ACB Group understand their clients’ requirements and facilitate their success by offering: cost certainty, program certainty, design certainty and visibility, they adopt a WIN-WIN approach to design and construct. ACB Group has grown and excelled both nationally and internationally. The high esteem in which they are held within the industry was reflected in their nominations at this year’s Irish Construction Industry Awards where they were nominated for ‘Sub Contractor of the Year’, ‘BIM Initiative of the Year’ and ‘Project Manager of the Year’. Launched in 2014, the Irish Construction Industry Awards recognises, encourages and celebrates original and innovative contractors, businesses, teams, consultants and projects that demonstrate excellence in the built environment. This is the premier awards programme in accolading excellence in Ireland’s construction industry and the gala awards ceremony is attended by hundreds of leading industry figures. The past winners list is a who’s who of Ireland’s construction industry and ACB Group’s three nominations is a notable achievement. The prestigious award for Project Manager of the Year was won by ACB Groups’ George McKitterick. “George is an integral part of our team and has been praised many times by our clients for his high quality of workmanship, leadership skills and can-do attitude and we are delighted that he has got the recognition we feel he deserves at this level highlighting ACB’s approach to project delivery,” explained director Georgina Quigley. Established by Managing Director Mark Quigley in 2003, ACB Group’s aim is to be recognised for their commitment to adding value for their clients through expert specialist solution delivery and continual process improvement. ACB Group have earned their reputation as industry experts over the past 15 years by designing, constructing and delivering versatile solutions of consistent quality. They were the first in their sector to achieve ISO 9001:2015 while they are also certified to OHSAS 18001:2007 and migrating towards ISO 45001:2018. They are consistent NISO Safety Award Winners, including commendation for their Safety Initiative Innovation. BIM (Building Information Modelling) is an intelligent 3D model-based process that gives architecture, engineering, and construction (AEC) professionals the insight and tools to more efficiently plan, design, construct, and manage buildings and infrastructure. ACB Group are working closely with their client to engage early in the design process allowing our clients leverage of our specialist technical design knowledge as early in the solution delivery cycle as is possible. “Achieving BSI Kitemark certification by the end of this year is our big challenge at the moment,” explained director Georgina Quigley, “as it will solidify our position as an industry leader.” An industry leader in delivering digital design and modern methods of construction to an ever evolving and changing construction environment. To achieve BSI ACB will demonstrate that they have BIM compliant systems and processes in place, employ trained and skilled Designers and Technologists with experience in delivering each of the required assessment criteria on their projects. They use industry leading technologies for Model/Drawing Production, 4D Project Planning, 5D Cost Planning, and laser scanning to verify design and as-built information. ACB Group plays an active role in the development of industry standards and guidance and will continue to drive forward and improve the industry’s growth in the specialisms of BIM and digital construction. ACB Group are active members of CITA with their Digital Construction Manager Louise Kelly being a keynote speaker at the recent BIM Gathering and a speaker at many Industry events such as Digital Construction Week at which ACB Group will present at this coming October 17th and 18th The Excel London. 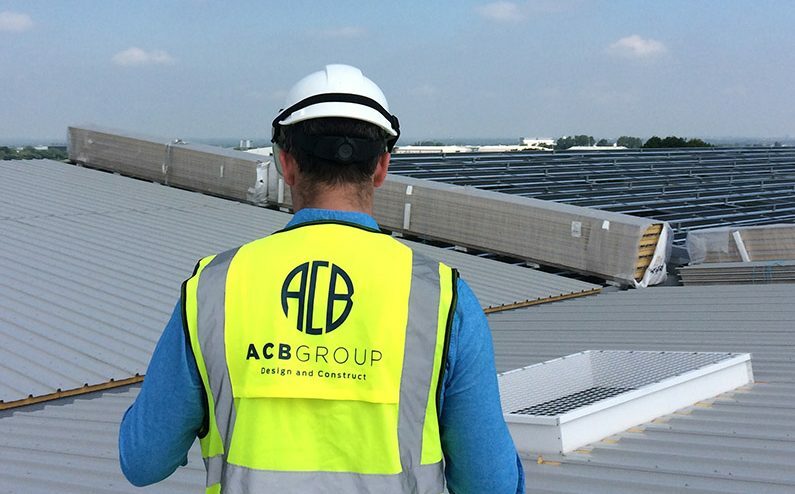 ACB Group are passionate about Innovation and technology in the built environment. “Our employees really are everything, and we have high calibre people working with us who are experts in design, architectural and digital technologies.” Georgina revealed. It will therefore come as no surprise to learn that ACB Group’s services are very much in demand at this point in time. They are currently on site at UCD Business School (Duggan Bros) and Mountpark, Baldonnell (Mac-Group).